Baseball America has been running a weekly prospect hot sheet for as long as I have had an interest in the minor leagues, and I have always enjoyed reading it and the follow up chat with the writer. The hot sheets have become even more enjoyable to read over the last couple of seasons, as unlike in the pre-Anthopolous years, Blue Jays prospects are making regular appearances on the list this year. Three of Toronto's better prospects; Travis d'Arnaud, Jake Marisnick, and Drew Hutchison, have peppered the hot sheet in their breakout 2011 seasons. To further raise the exposure of some of Toronto's prospects, I have decided to create a Blue Jays Prospect Hot Sheet that will detail the hottest 5 or so prospects over a 10 day period. While Baseball America uses a 7 day window, I feel 10 days gives a better opportunity to pitchers as most of them will make 2 starts in those 10 days, while the hitters will still get their 8-9 games. The eligble pool of players will be comprised of my Top 40 Blue Jays prospects, so, for example, 27 year old journeymen minor leaguers who smack 4 home runs in the 10 days will not be considered. The first Blue Jays Prospect Hot Sheet will be for the 10 days spanning from (and including) August 9th to August 18th. 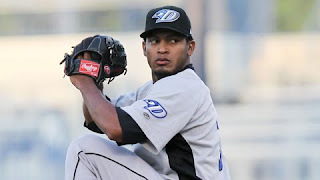 The Venezuela native Nestor Molina made two starts for the Fisher Cats this week -- his first two since being promoted after spending the whole year with the Dunedin Blue Jays. Despite not having overpowering stuff, Molina uses an outstanding changeup and his incredible command to carve up hitters in a way that chefs would be envious of. Molina's week was powered by his Thursday start, possibly his best start of the whole season, in which he went 5 innings, allowed only 2 hits, and struck out 9 batters. If not for his strict inning limit, Molina's 9.96 K/9 would put him near the top of the minor league leaderboard in strikeouts. Molina did not rank on my preseason Top 15, but should definitely find a home there after his 2011 season. Many eyebrows were raised when Hechavarria was promoted to Triple-A after posting a .622 OPS in 111 Double-A games this season. 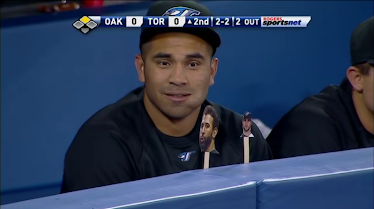 Regardless, Hechavarria answered the call, putting together perhaps the best 7 game stretch of his career. Hechavarria had 2 or more hits in each of his first 6 games in Las Vegas, and just to cap his week off, he threw in three walks. Hechavarria has the glove to play Major League shortstop -- his bat has been the only thing holding him back thus far. This week may have been a combination of luck and the PCL effect, but, just maybe, it is the start of something much bigger for the young Cuban. While this wasn't d'Arnaud's best overall stretch of the season, it's hard to argue with the power production in such a short period of time. His double and three bombs this week bring his season totals to 31 and 18 respectively, and he even tossed in a triple for good measure. The ten strikeouts are certainly a black spot on an otherwise outstanding week, but when you are making such powerful contact as d'Arnaud did here, your tendency may temporarily shift to swing now, take later. With no apparent September callup in sight, d'Arnaud should look to finish the last few weeks of his season with New Hampshire strong, and further solidify himself as one of the Blue Jays top 2 or 3 prospects entering next year. While d'Arnaud displayed how power can generate a strong line, Christopher Hawkins was highly productive by simply taking what pitchers gave him. Despite seeing only 3 of his 11 hits go for extra bases, Hawkins still managed to drive in 10 runs, and when pitchers didn't throw him what he wanted, he happily took the walk. The 2010 3rd round pick has had a strong year overall, and was recently named as one of the better left field prospects in the game in Jason Parks's (Baseball Prospectus) left field positional primer. Hawkins has accomplished all of this despite being drafted as an infielder and making the conversion to the outfield. Moises Sierra is the third Fisher Cat to make the list, which shouldn't be too surprising given New Hampshire's 6-4 record in their drive for the post season during this statistical timeframe. While he isn't a top prospect by any means, Sierra is a decent prospect who, despite being only 22 years old, often goes overlooked. Sierra has decent power and a sound approach at the plate, which is picturized nicely in this sample size. Sierra had two 3-hit games in mid-August, which were the meat behind his numbers. In a bit of a blast from the past, Travis Snider has taken his demotion to Triple-A very seriously. Since arriving in Las Vegas on the 8th, he has hit .378/.439/.568 (1.007 OPS) with a double, 2 HR, 13 RBI, 5 SB, and a 4/9 BB/K ratio in 9 games. The Lunch Box Hero graduated from prospect status years ago, making him ineligible to be ranked on the list, but as long as he keeps putting together stretches like this, his performance will be shared.